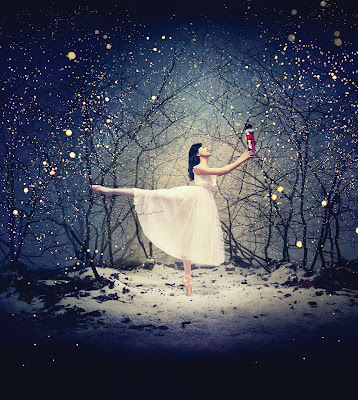 If it were possible to pinpoint the single most influential and enduring cultural moment in Culturebaby's life to date, without doubt I'd look to our trip to see the English National Ballet's gloriously Edwardian and throroughly spellbinding production of Tchaikovsky's The Nutcracker last January. I've waited until now to write it up, partly because I was fascinated to chart how far Culturebaby's devotion extended and partly because, with advent on the horizon, now is the time for us to be booking for our little sugar plums. The Nutcracker was the first ballet I saw as a child and I still remember it, but it wasn't by the ENB and I wasn't three. I was initially hesitant, unsure whether this was too soon. Would she sit still? Would she be able to concentrate? Would it be too frightening? I needn't have worried. By no means an unusual toddler, and as prone to fidgetting as any, she sat utterly entranced throughout the entire production, and not only that; she lived it daily for the following six months. Every day she requested to listen to the full ballet as she played, and on many an occasion she watched the Kirov's production on DVD and copied the steps. She created again and again the land of sweets with materials as diverse as playdoh, confectionaries and crayon. She saw the theme everywhere from the art of Hunderwasser to the decoration of a cupcake. Our old wooden nutcracker and a stuffed toy mouse were constant companions. We looked for every possible version of the story available. I have no doubt that the combination of a wonderful, Christmassy tale, with some of the most ingenious music ever composed have fuelled her adoration, but seeing such a brilliantly visual and exquisitely designed and imagined re-telling by the ENB have allowed her to relive the experience again and again. Given the extent of Culturebaby's fascination, I thought we'd share some great follow on activities and reads along the theme of the Nutcracker that are all very simple to do at home. We also had a number of great sessions with a batch of playdoh, creating cake-like structures and brightly coloured characters. 2. Find inspiration in art - It seemed that everywhere we looked there were potential scenes from the land of sweets ready to explore. Some of Culturebaby's earliest figurative drawings featured our eponymous hero and his nemesis. She also took rather a liking to drawing fields and fields of lollypops. In particular she adored a project we did to replicate one of the colourful artist Hunderwasser's iconic images. I will write this up in more detail soon, but this project was extremely simple. Using collages of circles of varying sizes and a range of colours and textures we made a series of very effective artworks. Immediately Culturebaby related these to the land of sweets of her own continued imagination. 3. Imaginative and dress-up play - Such a perennial and essential element of childhood. Happily Culturegrandma located an old wooden nutcracker, and Ikea provided a rat. Slightly bewildering a choice for a mass produced stuffed toy aside, we were entirely delighted to adopt our own mouse king. Culturebaby still sleeps with him in close proximity. 4. Dancing the ballet - The Culturebabies love their ballet classes, and Culturebaby is lucky enough to be able to attend an English National Ballet Juniors class weekly, but soooo much dancing can be done at home. Juggling scarves are a great and versatile prop, as are ribbons and wands. 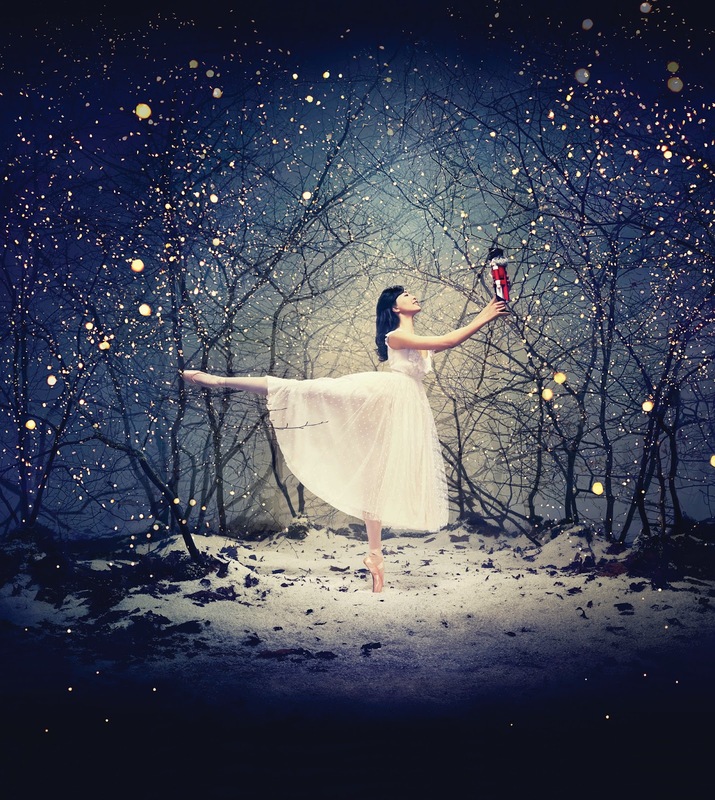 The soundtrack of the Nutcracker is so distinctive that it is easy for even the youngest child to follow the story as the ballet plays in the background. The girls also love studying the Kirov's production on DVD and attempting to replicate steps. If nothing else, it is exceptionally cute to observe. These baskets or trays are a really big hit in our household and I create different ones each season. Last year's Christmas basket featured a small Christmas tree with miniature decorations; wooden and felt snowflakes, stars, reindeer, bells, and other items to collect, match and sort; themed clips for fine motor skill practice and characters to bring alive as they play tiny musical instruments, receive presents and help to decorate. We also had a series of DIY themed shape and colour sorting toys. 6. Reading together - There are some fabulous versions of the Nutcracker out there specifically for young children. As a child I had a stunningly illustrated copy, most probably now out of print (which Culturebaby still adores) and I want to get my hands on Maurice Sendak's picture book, but these aside, I have five excellent recommendations that are perfect for pre-schoolers. Firstly, a trio from Usborne. As readers know, I'm a huge fan of this publisher. Their series of young reading books which introduce classic stories from nursery rhymes to Greek myths feature in Culturebaby's bedtime selections every day. Cleverly, they have produced a staged approach to their best-loved tales for developing readers who still want to read the same classic story, but in more depth as they grow. Using the same illustrator, they have built on their gorgeous short picture book adaptation by Emma Helborough and illustrated by Anna Luraschi, which is also available as a fantastic sound book version with clips from some of the best known pieces, to produce a more complex and in depth version for older children and early readers. At present, the two girls can both enjoy the simpler version together, and Culturebaby is very taken with the 'big girl' version. Usborne has also produced a beautiful volume of Ballet Stories for Bedtime. Containing fewer (but still plenty of) illustrations and reasonably in depth text, this compendium covers not only the Nutcracker but also six other classic ballets, including some lesser-known stories to discover. 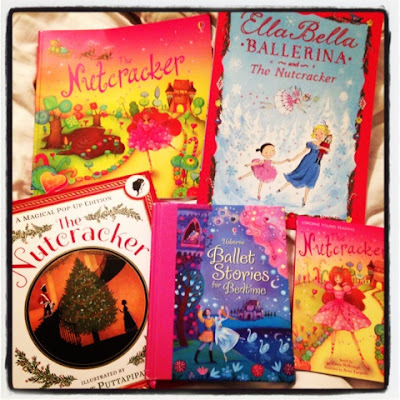 As we are devotees of the ingenious books of James Mayhew (author of the Katie series of art books) we were delighted to discover that one of the five Ella Bella books featured The Nutcracker. Ella Bella is a little ballerina who is lucky enough to regularly experience the enchantment of her ballet teacher's magical musical box. When she discovers herself alone with this box of delights, she is transported into the story and each time she helps to save the day for the characters. Aiding Clara and her prince as they seek to escape from the clutches of the mouse king, Ella Bella is transported through snow to the land of sweets and the ultimate Christmas party. 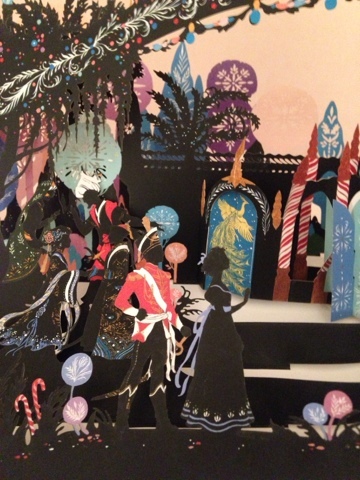 Finally, this year we have been sent a new, beautifully engineered pop-up edition of the Nutcracker story from Walker Books, illustrated by Niroot Puttapipat. For children of all ages, and indeed any adult, this simply told version of the classic story is gorgeously illustrated with characters in silhouette set against stunning skies and with splashes of coloured decoration. There is a final, exquisitely crafted, pop-up scene of the land of sweets. These theatrical images throughout the edition were inspired by the sets from the original 1892 production performed in St Petersburg. The descriptions are also simply beautiful. In this land snowflakes taste of rosebuds and raspberries, peppermint and honey; oceans are flecked with gold and "lollipops grew in the flowerbeds, lemonade flowed from the fountains, and a sherbet path twisted off into marshmallow mountains." The descriptions are sumptuous, lyrical and spellbinding. I know that Culturebaby will fall in love with it when she opens it in her literary advent calendar. Disclaimer: We were sent a copy of the new Nutcracker from Walker Books for review purposes, and we were given two seats to the brilliant 2014 production of the Nutcracker. All other materials are our own.